Staterooms are attractive one-room units with a private bathroom, like a traditional hotel room. 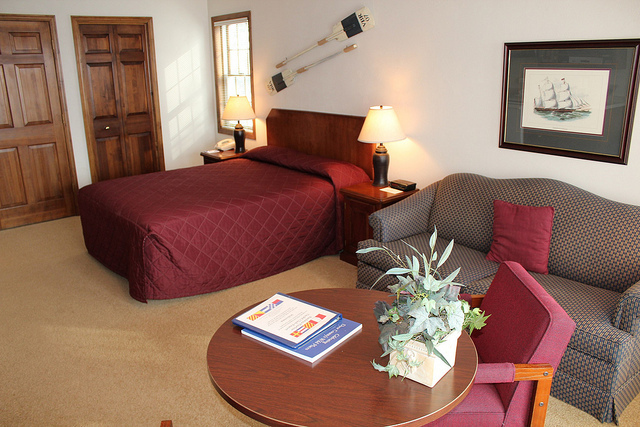 Staterooms can have either 1 King bed, 1 Queen bed, or 2 Queen beds. They generally will comfortably sleep 2 to 4 people. Your Stateroom will also have a sitting area with a sleeper sofa, a television, a kitchenette, and a dining table and chairs. Stateroom kitchenettes include a microwave, a sink, a coffee maker, a mini-refrigerator, and basic dining, glass and kitchen ware. All Staterooms feature either a private patio or balcony. There are simply no bad views at Baileys Harbor Yacht Club Resort, and your unit will have incredible views of either the harbor or the resort courtyard. These photographs represent a few of our Stateroom. All of our units have unique decor, but conform to Baileys Harbor Yacht Club Resort’s highest standards.